The British GT and Mini JCW finales at Donington Park produced some very nail biting racing. 2017 Mini Challenge JCW racer Brett Smith was crowned Champion at Brands Hatch, with one round to go, but arrived at Donington with one aim in mind – score maximum points towards the Sunoco 240 Challenge. For the Middleton/Tregurtha British GT4 pairing, they knew that they had to beat Alex Reed and David Pittard in the Lanan Ginetta for the British GT4 Championship crown, but also had to score as many points as possible towards the Sunoco Whelen Challenge to stay in the lead. Stuart Middleton went into the British GT finale at Donington Park as the Sunoco Whelen Challenge leader, just ahead of co-driver Will Tregurtha, and knew he had to score high to keep his Daytona dream alive. Stuart’s real threat was Will who, if he posted fastest lap and took the pole position points, could leapfrog Stuart in the Sunoco Whelen Challenge. Will Tregurtha was on track in the #55 HHC run Ginetta for the first GT4 qualifying when unfortunately a red flag situation meant he could not do better than fourth fastest. In the second part of the GT4 qualifying, Joe Osborne, in the Tolman Motosport McLaren GT4, then set a pole time no other GT4 pro driver could match. This meant that, at best, if Will put in the fastest lap in the race he could match Middelton’s average score. However, Stuart’s and Will’s combined qualifying saw them starting from fourth on the grid, and with no mistakes between the young driver pairing throughout the race, Stuart took the flag in second just behind Graham Johnson and Mike Robinson in the PMW McLaren 570S GT4. 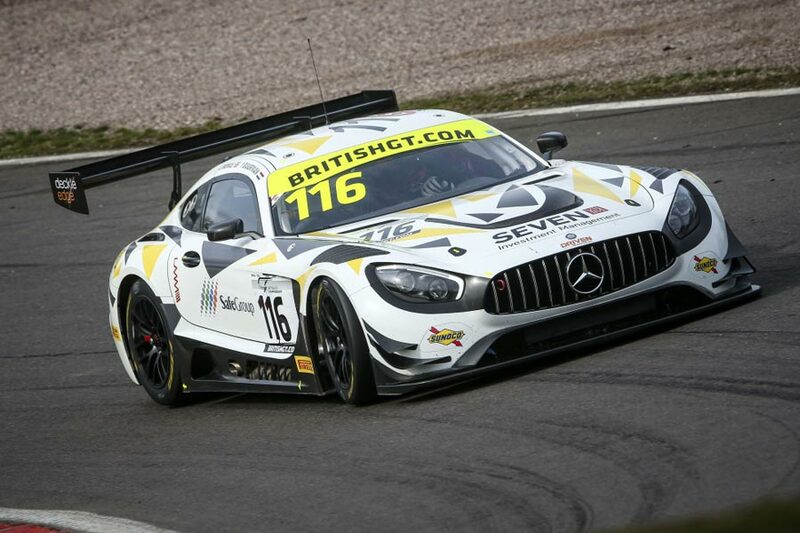 Second place in the 2-hour endurance finale resulted in Stuart Middleton and Will Tregurtha becoming the youngest ever British GT4 Championship winners. And if Stuart wins the Sunoco Whelen Challenge, he will be the youngest ever winner in the Challenge’s nine years of running. With this result, Stuart Middleton further increased his lead in the Sunoco Whelen Challenge over the only man who can still challenge him for the crown – Stuart Moseley in the Radical EuroMasters series. Moseley is now 6.45 average points behind Middleton but has 6 races to try to improve his average score. If he wins all remaining races, sets all pole positions and sets all fastest laps, he will end up on 97.97 points and win the Sunoco Whelen Challenge. However, to beat Middleton he must average 90.43 points per race out of a possible 140 (100 for winning, 20 for pole position and 20 for fastest lap) which is by no means a simple task. Stuart races at Monza from 30th September to 1st October and at Barcelona on 28-29th of October. Brett Smith in the Eurotech run #39 Mini Cooper JCW came to Donington Park as the 2017 JCW Champion and had nothing to lose when trying to maximise his Sunoco 240 Challenge points. Rick Parfitt Jnr, on the other hand, had everything to lose as he had to stay conservative with a focus on winning the British GT3 crown. But Rick, never having been to Daytona, had it in the back of his mind to try to get pole points and fastest lap points towards the 240 Challenge, and hope that Brett would not score enough points towards the challenge himself. However, pole points were not to be when Aston racer, Mark Farmer, on an Aston Martin suited track, stuck it on pole by 11 hundredths of a second just ahead of Rick. Brett Smith on the other hand was untouchable in qualifying and got both sets of pole position points. After a dramatic start to the British GT finale, where Championship rival Jon Minshaw made a cracking start from third to second, Rick struggled and lost one place to fifth on cold tyres. Luck had it for Rick that Minshaw spun within a couple of laps. Rick held on to the gifted fourth position when he pitted after one hour with Minshaw in seventh. However, due to a twenty second success penalty for Parfitt Jnr/Morris having won at Brands in the previous round, Minshaw’s pro-driver Phil Keen came out just ahead of Parfitt’s pro-driver Seb Morris. Keen, in the Lamborghini Huracan set a blistering pace to try to chase down Jonny Adam in the #1 Aston Martin to try to win the race. However, it was not to be, and despite the fastest lap, Minshaw/Keen finished third and Parfitt Jnr/Morris fourth, meaning that Rick and Seb became the 2017 British GT3 Champions. Meanwhile, after setting pole, fastest lap and winning race one, Brett Smith had one remaining race to improve his Sunoco 240 Challenge points. At that point he could still overturn Rick Parfitt’s 240 Challenge lead if he won the race and set fastest lap… Brett started from fourth on the reverse second race grid. Brett was in second within a lap and then outfoxed race leader Rob Smith into the first corner on the second lap and disappeared into the distance. He set fastest lap on his way to finishing off a very impressive final race weekend, scoring maximum points towards the Sunoco 240 Challenge and taking over the lead in the 240 Challenge from Parfitt Jnr by 0.57 average points. However, that was not to be, as later in the evening Minshaw/Keen were excluded for overtaking under yellow flag which elevated Rick Parfitt Jnr and 2016 season Sunoco Whelen Challenge winner Seb Morris to third in their race. Sadly for Brett Smith, this means that he finished just 0.42 average points behind Parfitt Jnr who finished on an amazing 96.53. But the Sunoco 240 Challenge is by no means decided yet as two Mini Cooper racers can still climb to the top. Either third place Jessica Hawkins, or fourth place Matt Hammond, separated by just 0.26 average points, can still become the 2017 season Sunoco 240 Challenge winner. To do so, they will need to score 380 points over the remaining three races at Snetterton out of 420 points available. That means a combination of three wins and four poles or fastest laps; or 2 wins, one 4thplace and all poles and fastest laps – very tough, but not impossible. We have to wait until 14-15th of October to find out at the Mini Cooper finale at Snetterton – exciting!